This page contains frequently asked questions by users in general. Why would I want to see Git in my Jira? How do Git and Jira work together? Is this safe? Will it cause trouble? Which version of Jira is compatible with Git Integration for Jira add-on? How to obtain the correct Jira user name? Git is a source code repository. Developers keep track of their source code using Git. Git relies heavily on branching and merging. Branching is making a temporary copy of source code for a single purpose like adding a particular feature or fixing a bug. Merging is safely moving the changes from one branch back to another. 2. What is this add-on? This is an add-on for Jira that mashes together data from a Git server with your Jira server. It let's people see code in Git in context with Jira issues. 3. Why would I want to see Git in my Jira? Git can be complicated and daunting – especially for non-developers. Jira users want this add-on so they can work with Git in the familiar Jira interface. 4. How do Git and Jira work together? In organizations with Git and Jira, it is common to have a branch for each Jira issue and branches for every version. When developers put their work in Git, they can include a Jira issue ID in the comments. With the Git Integration Plugin for Jira installed, Jira will then show the changes in the issue. 5. Is this safe? Will it cause trouble? It is a safe and well-tested plugin. We test this on huge Git repositories in large Jira instances. Over 2000 organizations in 70 countries use the Git Integration Plugin for Jira add-on. 6. Which version of Jira is compatible with Git Integration for Jira add-on? Some versions of the Git Integration for Jira add-on, are compatible with specific versions of Jira. For example, the Git add-on v2.9.1 is compatible with Jira Server versions 6.3 up to 7.1.9. For a more comprehensive view, see Git Integration for Jira add-on Version History. In the Version History page, you can try or buy the Git add-on or download it for use with manual installation. 7. 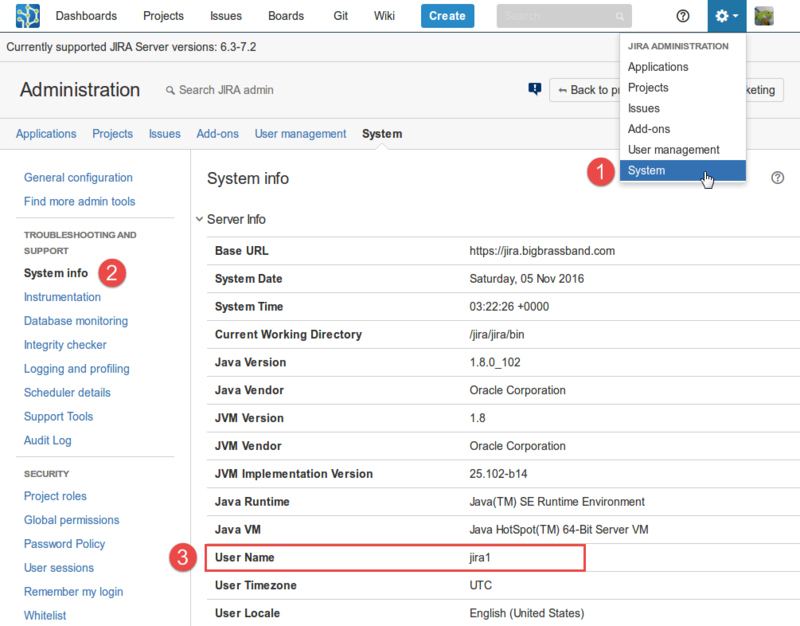 How to obtain the correct Jira user name? Go to JIRA Administration > System > System Info.